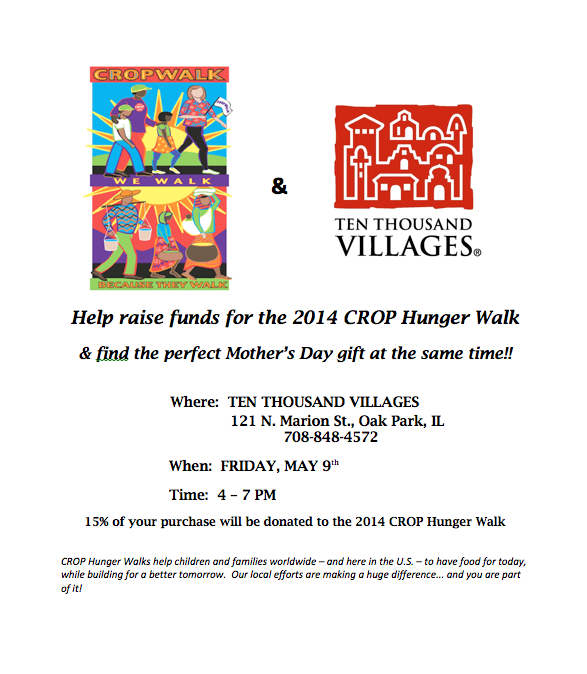 Ten Thousand Villages Oak Park is having a shopping benefit night for the CROP Hunger Walk. On April 23, 2015 from 4:00 p.m. to 7:00 p.m. they will donate 15% of all sales to our walk. This is a Win Win for those who shop and support fair trade goods and for those that champion the cause of Ending Hunger One Step At a Time. We always appreciate the business support in our communities and this is but one example of how local businesses make a difference too. So many business have put our CROP Hunger Walk sign in their window to draw attention to the walk and our efforts. Please support them; which supports us; which supports those in need. Sign up and walk with us. 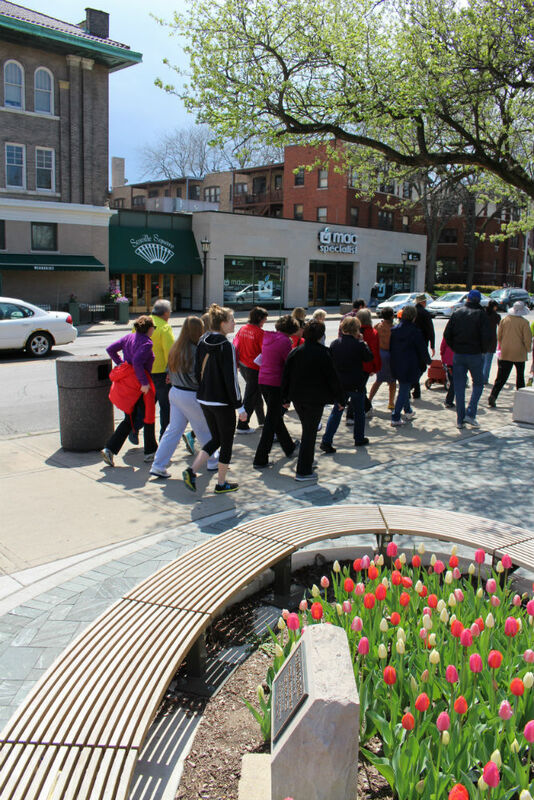 The CROP Walk has been a tradition in Oak Park, River Forest, and Forest Park for the past 31 years and is always full of such joy and excitement. This year’s Walk certainly did not disappoint! We were so thankful for the peace and blessings, holy sunshine, blessings from Reverend Sally Iberg, singing and clapping, face painting and balloons, inspirational walk signs, Rest Stops at Ascension Church and St. Paul’s Thai Lutheran Church, the hunger advocacy table, homemade cream cheese and homemade CROP oatmeal cookies, the great fun we all had at the photo booth, the Kingdom Runners cheering at the Finish Line, and of course, all of the wonderful walkers! We are also exceedingly appreciative of Wednesday Journal Inc., which has provided us space for our full-page “thank you” advertisement for FREE for almost 20 years. This has provided us with the opportunity to thank all those who donated time, effort, and talents, as well as our supportive local businesses, that together makes it all possible! The Wednesday Journal is the “pulse” of the community, and we are so fortunate to have such a community-oriented paper available in our area. One of the benefits of the Wednesday Journal is their email updates of breaking news in the community. We encourage you to sign up for their emails as a further benefit of providing the best news in the area. Just click on this link to sign up. Please keep those donations rolling in! April 30th is quickly approaching and we are so thankful for the many donations that we have received so far, which will all be eligible to apply to the Feinstein Challenge! We hope to receive as many of our donations as possible by April 30th so they, too, can be counted in the Feinstein Challenge. The Feinstein Foundation will divide $1 million among hunger-fighting groups that raise funds during March and April. So the more we raise by April 30th, the more we receive to help end hunger here at home, and around the World. CROP Hunger Walk is this Sunday, May 4, 2014. Donate now. Ten Thousand Villages of Oak Park is offering a fund raising sale on Friday, May 9th. While right after the CROP Hunger Walk it is just before Mother’s Day. So a benefit for all. They are located at 121 N. Marion Street, between Lake Street and North Boulevard, in Oak Park. Please visit them on Friday, May 9th between the hours of 4 p.m. and 7 p.m. They will donate 15% of the purchases during those hours. Hopefully you and/or your Mom will benefit from the purchase. We continue to thank our business supporters who not only donate money but also provide exposure to the community about the CROP Hunger Walk. Please support them. Please sign up for the walk, this Sunday.